The Global Volcanism Program has no activity reports for Tahalra Volcanic Field. The Global Volcanism Program has no Weekly Reports available for Tahalra Volcanic Field. The Global Volcanism Program has no Bulletin Reports available for Tahalra Volcanic Field. The Global Volcanism Program has no synonyms or subfeatures listed for Tahalra Volcanic Field. The large E-W elongated Tahalra volcanic field covers an area of about 1800 km2 in the Hoggar Province of southern Algeria. It lies WSW of the town of Tamanrasset and was active from the Miocene to the Holocene, producing alkaline Strombolian cones and lava flows. The field was constructed over a basement of Precambrian metamorphic and plutonic rocks of the Tuareg shield. A dozen trachytic-to-rhyolitic lava domes and spines formed during the Pliocene, and Pliocene-to Pleistocene activity formed about 100 small Strombolian basaltic (mostly basanitic) cones. The most recent activity during the Pleistocene and Holocene produced about 20 maars and cones along the northern margin. Dautria J M, Dostal J, Dupuy C, Liotard J M, 1988. Geochemistry and petrogenesis of alkali basalts from Tahalra (Hoggar, northwest Africa). Chem Geol, 69: 17-35. The Global Volcanism Program is not aware of any Holocene eruptions from Tahalra Volcanic Field. If this volcano has had large eruptions (VEI >= 4) prior to 10,000 years ago, information might be found on the Tahalra Volcanic Field page in the LaMEVE (Large Magnitude Explosive Volcanic Eruptions) database, a part of the Volcano Global Risk Identification and Analysis Project (VOGRIPA). There is no Deformation History data available for Tahalra Volcanic Field. There is no Emissions History data available for Tahalra Volcanic Field. 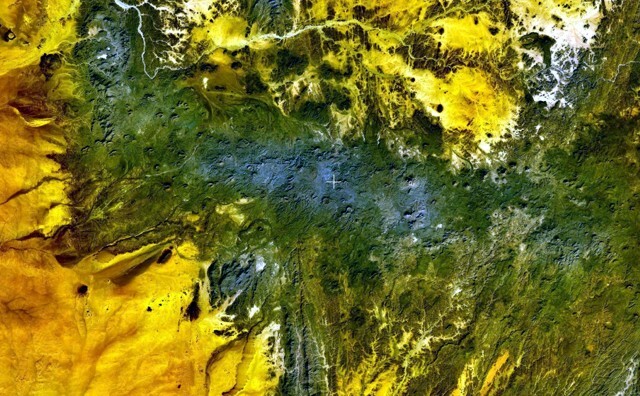 The dark-green and bluish-gray areas extending across this NASA Landsat image depict the elongated, E-W-trending Tahalra volcanic field, which covers an area of about 1800 sq km in the Hoggar Province of southern Algeria. About 100 small strombolian basaltic cones formed during the Pliocene and Pleistocene, and the most recent activity during the late-Pleistocene and Holocene produced about 20 maars and cones along the northern margin of the volcanic field. There are no samples for Tahalra Volcanic Field in the Smithsonian's NMNH Department of Mineral Sciences Rock and Ore collection. Large Eruptions of Tahalra Volcanic Field Information about large Quaternary eruptions (VEI >= 4) is cataloged in the Large Magnitude Explosive Volcanic Eruptions (LaMEVE) database of the Volcano Global Risk Identification and Analysis Project (VOGRIPA).